I just recently found out about the Game Theory videos on YouTube. They’re somewhat tongue-in-cheek, but with a definite sense of wanting to teach something and explore how the world of video games works, which is pretty similar to what I try to do in my own video game posts. I looked at one of their videos last week, and this time I’m featuring another one, about how all video game worlds intersect. This has always been an idea that interested me, and it does seem certain that some games take place in the same world as others. On the other hand, looking too closely at crossovers can be a dead end, as they’re not always canonical from both ends. To give a quick example, The Simpsons did crossover episodes with both The Critic and The X-Files, but those shows regarded Simpsons as fictional. So just because we see Mario making a cameo appearance somewhere doesn’t necessarily make the entire Mushroom World real within that game’s universe. It’s also important (well, as important as things get when discussing such a topic, anyway) to distinguish games that take place in purely fictional places, like the Mushroom Kingdom or Hyrule, from those that take place in somewhat fictionalized versions of our own Earth. We know, for instance, that Street Fighter occurs in various locations throughout our world, and the Castlevania series is mostly set in Europe. The latter apparently also occurs within the same continuity as Bram Stoker’s original novel Dracula. The Mega Man games take place on a future Earth, and even the Metroid series mentions Earth as the headquarters of the Galactic Federation. Hence, it’s likely that Zebes and SR388 are supposed to be in the Milky Way Galaxy. Perhaps even more confusing is the fact that some of the Final Fantasy games (IV and VII come to mind) show the world in which the game is set existing within a solar system just like our own. When you get right down to it, I suppose mentioning real-world (or real-galaxy) locations doesn’t necessarily mean a game is set in our world, but it usually seems likely. I probably talk more than is healthy about Captain N, a show that tied together multiple video game worlds. Within the cartoon, they all appear to exist within fairly close proximity to each other. Because some of the games are set in real-world locations, this gets a bit confusing. 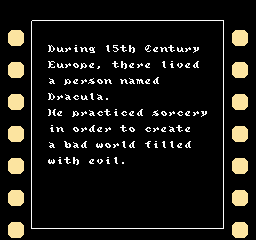 For instance, is the world of Castlevania totally different from Earth, even though the games are clearly supposed to be set in Europe? For the most part, as you might expect, the show just totally ignored these issues. Videoland also has versions of real-world celebrities (Larry Bird and Bo Jackson show up in the third season) and fictional characters who didn’t originate in video games (such as Dracula, even though they always just call him “The Count”). Looking at it this way, the Mike Tyson who boxes with Little Mac need not be the same as the domestically violent one we know from real life. And since we’re discussing cartoons, the Mario ones said that the famous plumbing brothers were originally from Brooklyn, and I’ve heard that a player’s guide for Super Mario 64 refers to Mario as a Brooklynite. The later games get away from this idea, but it is a way for Mario and Luigi to exist in games set in both real and fictional worlds. But if they do visit our world, do they know they’re video game stars? And do they get any royalties for appearing in the games? This entry was posted in Captain N: The Game Master, Cartoons, Castlevania, Final Fantasy, Mario, Mega Man, Metroid, Punch-Out, Street Fighter, Super Mario Bros. Super Show, Television, The Simpsons, Video Games, Zelda and tagged bo jackson, bram stoker, count dracula, dracula, final fantasy iv, final fantasy vii, game theory, hyrule, larry bird, little mac, mike tyson, mushroom kingdom, mushroom world, the critic, the x-files, videoland, zebes. Bookmark the permalink.